Dead Homers Society covers Simpsons news, along with chronicling the highlights and decline of The Simpsons. Formerly SNPP.com, one of the most detailed, and oldest Simpsons fan sites. A great source for jokes, memes, sound clips, and other Simpsons history, broken down season-by-season, episode-by-episode. Trying to determine the best Simpsons episode ever, through head to head competitive brackets! 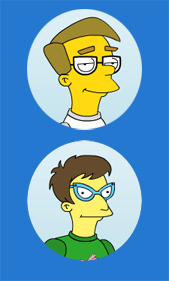 Explores The Simpsons as a tool for teaching. Tracks a lot of the [now] obscure cultural references from the show. Me Blog Write Good covers The Simpsons up through season 21. It isn’t updated anymore, but they’ve covered all the classic episodes though. Its creator has other projects. Tracks the homages to classic films that run through The Simpsons. Wide & Tall Simpsons Caps is what is sounds like, backgrounds are stitched together to complete the image you never get to see all at once on the show. A really clever look at animation work. Its creator has a blog doing the same for Futurama. Mostly classic screencaps, gifs, merch and art. Old and new Simpsons gifs, screen caps, merch and art. Possibli the most fun Simpsons Trivia fans on Facebook. Jerks from Tower One covers The Simpsons Classic era by theme not by episode. Discusses The Simpsons, episode by episode, with guests. Worst Episode Ever podcast specifically covers the post-classic era seeking out the worst episode. The Simpsons Index is reviewing the whole life of the show, and organizing by the best to worst. Nice chemistry from a good chummy crew, based in Sydney Australia. Bootleg Bart blogs about off brand Simpsons merch, cosplay, art, and news. Here’s a great mashup, Nat is a fan of both The Simpsons and metal music. This is his blog. Host of our monthly trivia show since late 2015. Run by the same great folks from Braggs. Swanky bar, and trivia on the patio! One of Phoenix’s best and most lauded poets. Has co-hosted and guested our monthly trivia show. Russ was a guest at our trivia show, he creates comics, podcasts, and plies his talents all around Phoenix. A great improv based podcast. We’ve been on the show, each eposode takes one idea and spirals into unknown worlds! Gren guested as a the Mathamagician at our trivia show. In addition to comics he also trades in pop ephemera, and has run a vinyl toy shop! Ned Flanders themed metal band. Ned. Flander. Metal. Band. We were on this once as part of their Sounds of the City series. Four days of comics, cosplay, and fun in the Valley of the Sun. (Now closed) Original host and sponsor of our monthly trivia show.